Hedgehog Day 2017 is the second time I’ve been asked to help out at Shepreth Wildlife Park. I’ve known the owners for years and even volunteered there in the past, but this time they approached me in my newly-found CELEBRITY status, what! I don’t see myself in that way, but to help a friend for a good cause is always a pleasure to do and this time I could drag the infamous Raph along with me to complete the Eden #Rafton duo. Raph and I were due to feed the tigers at 2pm, but Rebecca Willers very kindly allowed us to join the keepers on their rounds earlier in the day as well. The keepers asked our shoe sizes, which seemed like an odd question but we were then given a pair of waders each (getting worried yet, I was) and a stack of pans containing animal feed. Then they led us out into the park itself. First came the meerkats, “mere-cats?” Raph asked, “are they real? I thought they were made up for an advert in the middle of Coronation Street!” Raph was sincere, and watching him enter their enclosure was amazing, the look of bewilderment, joy and awe was fantastic to see. As a few dozen little critters ran around his feet I finally found Raph stuck for words. Well almost. That was just the start, and there followed some precious memories like… a marmoset sitting on his shoulder; tamarins eating from his hand; the squidgy belly of an armadillo; and Sully the Ibis who took a dislike to Raph and I because we had sat too close to his favourite keeper. The day was amazing and barely scratched the surface of what Shepreth has to offer. Eventually, we were guided to the tiger enclosure to make our big appearance of the day. Amber the tiger is over 17 years old and a beautiful beast. Her companion Rana was lost to old age recently and the Park are worried that Amber is getting on too. After a lot of security checks and double checks, we were ushered into the enclosure, with two huge metal shutters separating us from Amber — just feet away from us. The meat was horse meat as we found out as one keeper walked past with the remains of a horse’s head from a previous meal . I also took a closer look at some of her toys, including a huge orange ball with deep gouges from her teeth and claws. I picked this up to show Raph and one of the keepers pointed out that they smear it with animal poo to entertain her… it was 20 mins before I had the opportunity to wash my hands properly and it probably took that long to wash them as well! All in all, it was an amazing day! 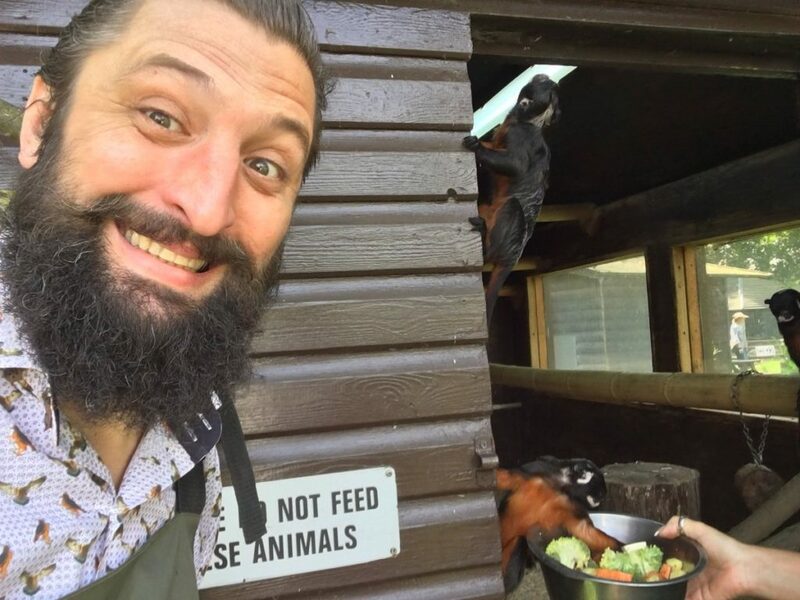 If you are in or around the area and want to do something different and really good fun then look up Shepreth Wildlife Park. As well as regular entry they also do “keeper for a day” and “meet the animals” experiences.